Remember last year, when I got all up on a soapbox over car manufacturers' reticence to promote the World Touring Car Championship's Sonoma stop? It's no surprise they'll be silent again this year. That means it's up to you to make WTCC a thing. So make it one. Why are those car manufacturers silent? It's because they've withdrawn from the series. With no Chevrolet or Ford (BMW left in 2010), the WTCC manufacturers' championship is now a shoot-out between Honda and Russia's Lada, which is like a free-throw contest between Steve Nash and the light-saber kid from YouTube. Right now, Honda's leading by like 40,000 points. That's cool. It's nice to see Honda running a whole season and Lada just making a go of it (see #4 below). 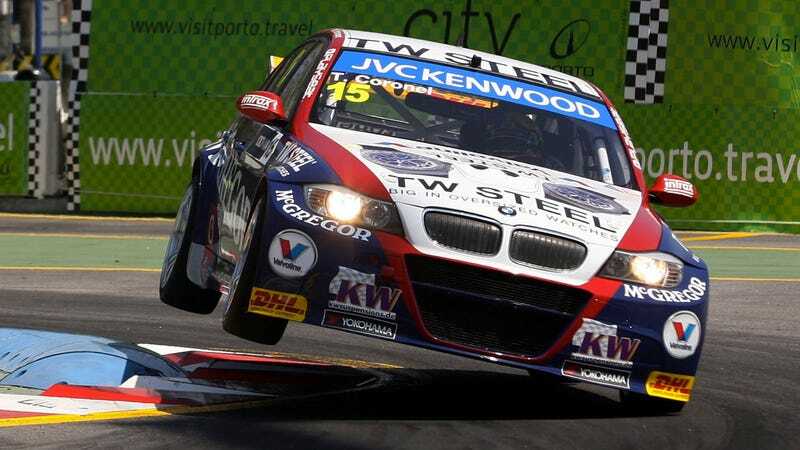 But to survive in the longer term, WTCC needs more support from manufacturers. That's why you're seeing a push toward large automotive markets like the U.S., Japan and China — and those with growth potential like Russia. A foothold here in the U.S. would go a long way toward getting more factory teams into the WTCC paddock. 1.) Sometimes the cars go fast. Despite a qualifying anomaly that saw WTCC cars drafting each other while limping around Salzburgring earlier this year, Sonoma's 12-turn, 2.5-mile road course comprises winding, consecutive corners and broad elevation changes that will make for better wheel-to-wheel racing. That's in contrast to Salzburg's long straightaways and heavy braking zones that put a priority on drafting and tire saving during qualifying. FYI, WTCC cars are production-based four-door, two-wheel-drive sedans modified for racing with 1.6-liter turbocharged engines and six-speed sequential gearboxes. Top speeds on tracks with the longest straights are like 264 kph, or around 164 mph, which isn't terrible. 3.) Rubbing is racing. WTCC races are notorious bumpfests, with drivers unafraid of making aggressive paint-swapping moves a la Nascar and Death Race 2000. 4.) They race Chevy Cruzes. This sounded like a more compelling reason inside my head. Actually, I like the Chevy Cruze; It's much better to drive than you might think it is. (Rent one and see.) But really, what I mean is, in WTCC they they race the kinds of cars people like us might actually buy. 5.) They race Russian cars. Where else could you see Ladas race BMWs? Ok, maybe here and here, but definitely in Sonoma too — that's where! Just don't yell "Put it in H!" They hate that. 6.) WTCC drivers come in a wide range of age and experience. It's not just a one or two-demographic series, like Nascar or Pinewood Derby. For instance, Bamboo-Engineering's James Nash is six years old, and according to Willard Scott, Castrol Honda WCT's Gabriele Tarquini just turned 113. It's like Cocoon III out there. [In WTCC] there are two ex-F1 drivers, two GT1 World Champions, two multi-time ice racing champions, several Le Mans (that’s Le Mans not LeMons) and Daytona winners amongst the ranks of these “so called drivers”. If that’s not enough for you, arguably the best driver in the world, Sébastien Loeb, thinks enough of the series to bring a full factory effort with him to the WTCC next season. That’s a lot of talent for “so called race car drivers”. 8.) Wait, did you say Sébastien Loeb? Yes, he did. Loeb and Citroën Racing will be fielding two Citroën C-Elysée racecars in 2014, one driven by the nine-time WRC champ himself, the other by Yvan Muller, current points leader and three-time WTCC champ. That means you have a year to get into WTCC, and learn the new rules, before the breakout season. 9.) WTCC might host Robert Kubica's comeback. We've been rooting for the former F1 hopeful to return to serious competition after since a devastating rally crash derailed his F1 career in 2011. The racing rumor mill has placed Kubica, who's been racing a Citroën DS3 in WRC2, into the seat of Citroën WTCC car for at least part of 2014. 10.) WTCC provides homes for ex-drifters. Hong Kong native Charles Ng competed in Formula Drift before starting his touring-car career in Asia. That was before WTCC graciously took him in, saving him from toppling backward onto his master's degree in Economics from the University of San Francisco. The new Civic Type R will be developed specifically for Europe and will incorporate developments learned from Honda’s experience in the World Touring Car Championship. [Honda CEO, Takanobu] Ito wants it to be the fastest front-wheel-drive car around the Nurburgring, which means it’ll have to beat the Megane 265 Trophy’s time of 8 min 7.9 seconds. Honda's UK MD Dave Hodgetts went on to tell Auto Express that the new Type R "will have at least 265bhp... the engineers' target is 300bhp though." By the way, Honda's got that new Civic Type-R slated for 2015. Maybe if you're good and you eat all your EU Directive 2008/72/EEC-certified vegetables and watch WTCC, they'll bring it to the U.S. It couldn't hurt to try. What: World Touring Car Championship race weekend, including Pirelli GT3 Porsche Cup, U.S. Touring Car Championship, time attack and track-car demo by Evasive Motorsports and Slammed Society Showcase by Fatlace and Yokohama Drifting Demo.